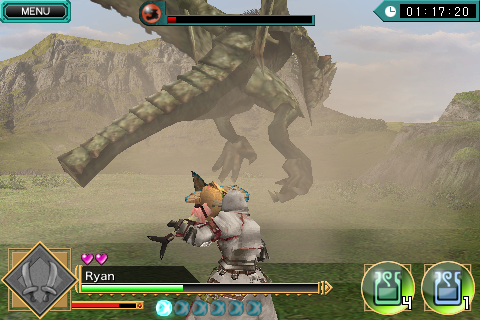 I don’t think I ever even gave it a passing mention here, because I’d basically abandoned the blog for the duration of 2010, but when Monster Hunter Tri hit the Wii in April last year, I developed a sickening obsession with the game. And I mean that literally. I gave up a lot of sleep for Monster Hunter, and my health suffered for it. 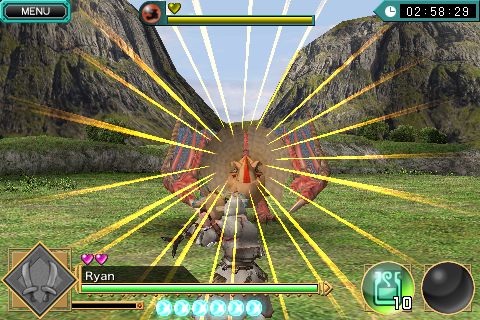 Then it got worse when I discovered Monster Hunter Freedom: Unite for PSP. I mean, my PSP was happy because it was actually getting some use (Dissidia: Final Fantasy has had the same effect), but Stephanie did not, because I had access to Monster Hunter wherever and whenever I wanted. At least with Tri, I was only able to play while in my room. 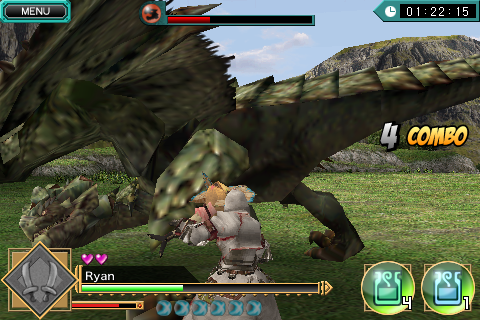 If you haven’t heard of the Monster Hunter series, get on the bus, man! It’s the only reason I’ve ever been compelled to play video games with people online for reasons other than novelty, and aside from Castlevania: Harmony of Despair, it’s been the only one since. The premise is that you, with up to three other hunters, march around in various environments with gigantic swords (or axes, if you’re cool) and track down even bigger monsters. You then proceed to attempt to slay or capture said beasts. Most of the time you will be slaughtered. These monsters are exactly as powerful as they are huge, and most of them are fast, too. Your only hope is to use monster loot and precious stones and whatnot to craft slightly stronger armor and weapons. Even the strongest armor will only keep you alive through a handful of hits from the bigger beasts, though, so it’s more about learning the monsters’ weaknesses (physical and elemental), patterns, and tells. Knowing when to strike is far more important than the next weapon upgrade. The downside to the game’s process is that while it’s fun, hunts can tend to take a long time. If you’re really unlucky, you can spend your entire time limit (each hunt it timed, BTW) just trying to find your mark. 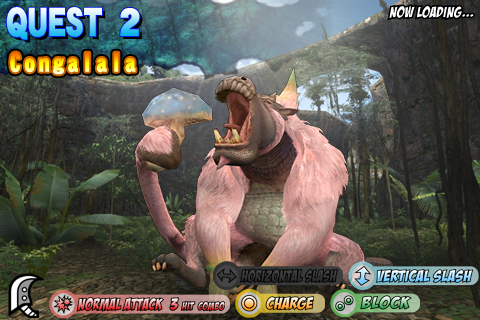 It’s a less common problem in MH3 than MHFU, because monster start points seem to be randomized in the PSP game, but the beasts still wander the environments fairly randomly in both games. 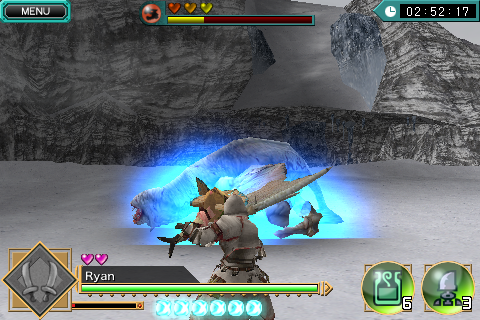 Monsters can also take a lot of damage, and since they have no visible life bar, you’re stuck wondering until they start to limp around and run away from you in hopes of recovering a bit. I think that in the context of the game, this is fine, but in the real world, you can’t just sit down and run a few quick hunts. Unless you’re playing solo runs of the weakest monsters, you have to make a real time investment when you play Monster Hunter. 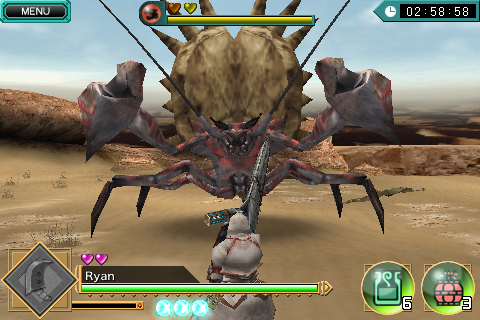 And that’s where Monster Hunter: Dynamic Hunting comes into play. 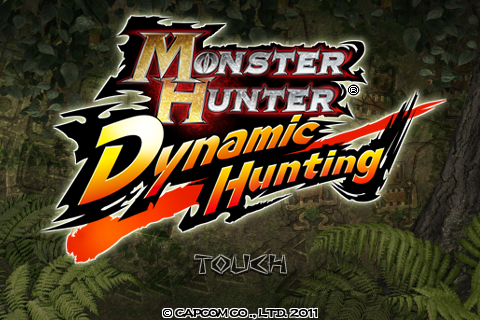 Dynamic Hunting is Capcom’s newest entry in the series, and is the long overdue first iOS Monster Hunter title. Give how big the series is in Japan and that it’s gaining some fairly good traction in North America, I’m surprised that Capcom, the house of a million sequels, took so long to get this out. I’m glad they waited and crafted an excellent mobile spin-off of the series, though, instead of rushing out a quick cash-in app. 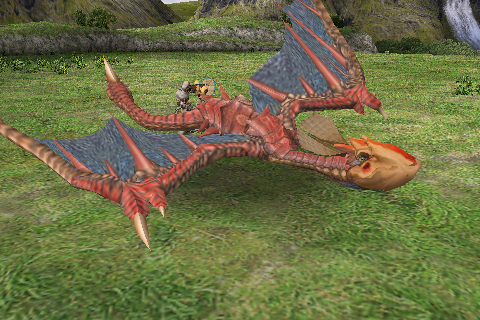 So like I said, I think MHDH is pretty fantastic. It’s got the spirit and personality befitting of a true Monster Hunter title, and it’s extremely accessible and quick to play too! The important thing for a mobile game, as I’m sure everyone who knows anything about game development knows, is that you can pick it up and play for three minutes here and there. That’s why games like Angry Birds and Fruit Ninja work so well on the platform. Yes, developers will try to export these titles to dedicated gaming machines to make a quick buck off the gullible casual crowd, but they belong on a handheld device. I, personally, have never felt that Cut the Rope would benefit from a WiiWare or Kinect re-release. I don’t go to my couch and TV for bite-sized games. That’s where I go to put in an hours-long session of Final Fantasy XII or bounce around aimlessly in the vast worlds of Super Mario Galaxy. What Dynamic Hunting does differently is cut out the hunt part entirely. It probably should have been called something more along the lines of Dynamic Fighting, but we’ll ignore that little inaccuracy. 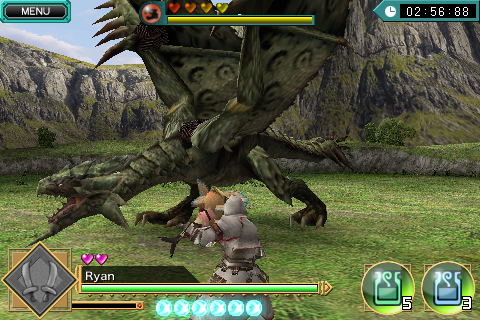 The whole concept of the game is straight one-on-one fights against a select handful of the MHFU roster. I’ve only progressed to the point of seeing twelve available monsters in three tiers of four, but I’ve got my fingers crossed that there’s still a fourth tier to unlock. Five would just be gravy. 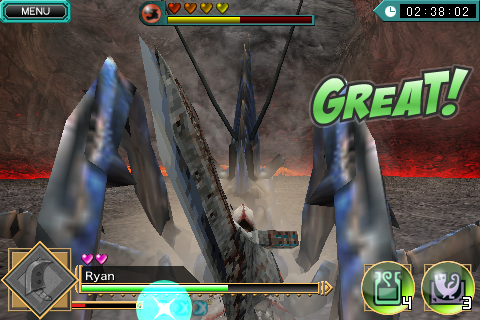 While loading times are a little longer than I’d like, you can navigate your way into a fight very quickly, and I don’t think I’ve seen a mission time limit go over five minutes yet, resulting in the first Monster Hunter title that you can actually make a little headway in over the course of a single lunch break. Though the true hunt is out, most other Monter Hunter elements are in, albeit in a scaled-back manner. You still have items, though the extent that you see them is in a few potions and another item specific to each hunt which are available each time you start a hunt. You can’t buy new stuff or swap in more useful tools, but the mechanics don’t really require item use. Antidotes are going to be the non-potion item used the most, as all the hunts are kill missions; capturing monsters is no longer an option. You can buy power-up drinks to use before a hunt with in-game currency or pay real money for “G” versions of them, but to be honest, I keep forgetting they’re even there. 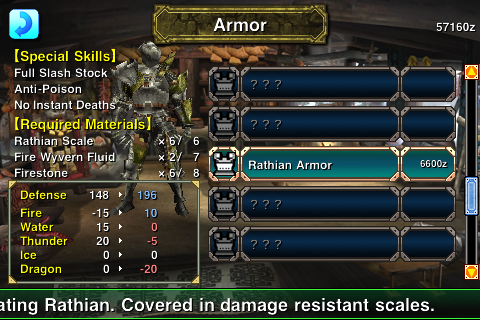 Weapons and armor run on the same crafting system as full Monster Hunter games, with a few key differences. Since exploration is out, all your materials are monster loot, making it necessary to remember which monsters drop which ores. Armor no longer comes in separate helmets, gloves, body armor, and leggings, but rather as complete sets. This is nice because you never look like a mismatched idiot, but you also lose the benefit of mixing and matching bonus effects. Weapon choices have been reduced to sword & shield combos, great swords, and dual swords. The options give you about as much variety as you’ll need, but I’m very sad that my beloved switch axe wasn’t included. Given that the game is based on MHFU, I guess the switch axe wouldn’t have been included anyway though. Not sweating the loss of lances though. Never liked the lance. Notably, you cannot choose to play as a female hunter. This had better be fixed in an upcoming update. Controls are great for a touch-only title, even though they suffer from the usual lack of accuracy plaguing all touch games that require fast and precise actions. Your hunter is in a constant state of “z-targeting,” always facing the target monster, and dragging in any direction will move him in that direction. A tap will make him swing his weapon, and a swipe will launch a super attack. Holding two fingers on the screen will block (unless you have the dual swords equipped, which cannot block), and a two-fingered swipe will cause your hunter to dodge. It’s super-easy to get the hang of, and ends up being a game of delivering a few blows when you see and opening and watching for the dodge cues. 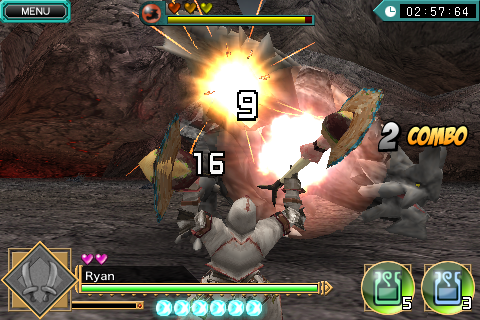 The swipe attack, I find, is the only action that doesn’t work reliably, which is a shame because using one when a monster is winding up its own attack will result in a counter and a nice big opening to get in a few more easy hits. The game is not perfect, however. Monster Hunter games are not easy to begin with. Like real hunting, they require skill and patience. Generally you will hunt a new monster and get killed a couple times before you know it well enough to really stand a chance. 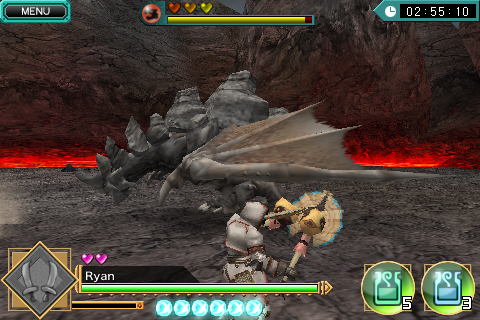 Eventually the monsters are so powerful that they do get really hard (Tigrex and Barioth spring to mind), but the difficulty curve is usually sloped enough that it doesn’t feel like you’ve gone from basic training to expert mode. Dynamic Hunting though, doesn’t really work the same. The first four monsters put up a fight, but all of them go down fairly easy. 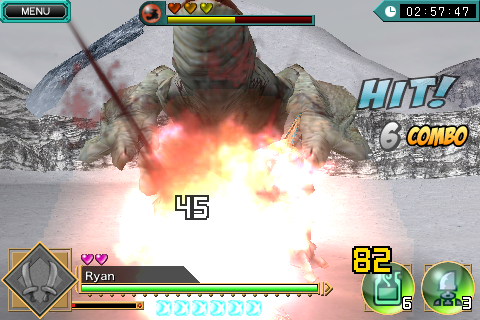 The gap in difficulty between Khezu and Basarios, though, is huge. 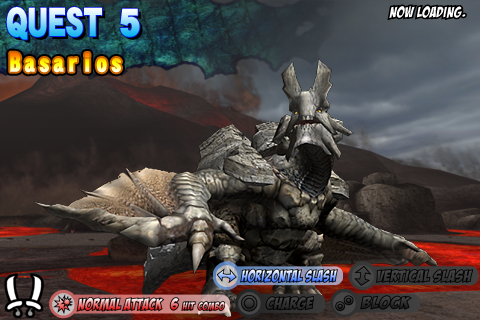 Basarios is not overpowered or unfair, but his attacks have short wind-ups and small dodge opportunities. You really have to step up your game at this point. The jump from tier two to tier three is just as wide, and I’ve only barely been able to survive the first two monsters of that tier. It never really feels like you’re hitting a brick wall, but the game definitely goes from a casual timesink to an intense test of monk-level focus. This is where patience, more than anything, is absolutely necessary. If there is a fourth tier waiting in the wings, I shudder to think of the horrors that will reside there. 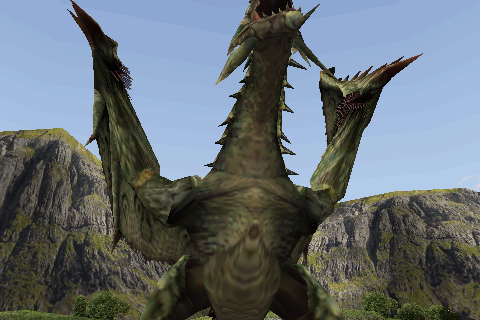 I’d like to be able to see some of the later monsters from MHFU though, as I hit my brick wall there at Kushala Daora. The other slight issue I have with the game is the ranking system. Each hunt will end with you being assigned an overall rank from S to D. This rank is based on four factors: mission, life, time, and parts. You’ll get a sub-rank for each category, and your hunt rank is decided by (I think) the average of those. The problem here is that the game never tells you what those categories mean. Life and time are easy enough to figure out, and Monster Hunter vets can deduce that the parts score is earned by damaging specific points on a monster’s body. The mission rank is a huge question mark though. 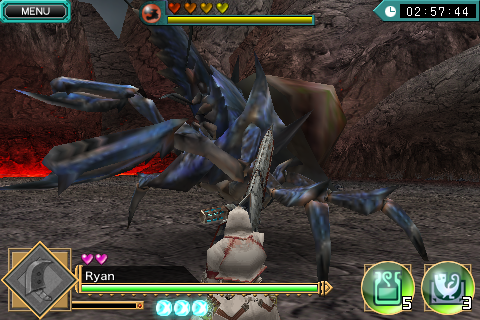 The Monster Hunter Wiki says that it’s a score of how well you dodge and block a monster’s attacks. That’s all well and good, but if you kill a monster without giving it an opportunity to attack (only possible on Yian Kut-Ku and maaaaybe Congalala), you get a big fat zero. Needless to say, earning even an overall A on a hunt is hard, whereas only the best hunters could even dream of seeing that big S on their results screen. The last thing I need to complain about is sort of a Super Smash Bros. quibble. 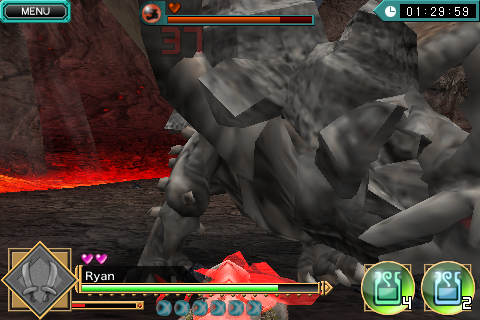 I know that there are a limited amount of monsters in this game. I wouldn’t be surprised if the third tier was the last. But within those twelve monsters are two colour-swapped versions of previous monsters. Includng Yian Kut-Ku and Yian Garuga was a little sketchy, but they’re different enough to justify having both in. 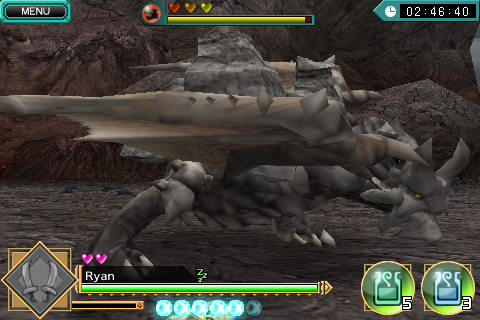 Blue Yian Kut-Ku, however, is just a slightly faster version with more HP. Red Khezu is the same way. Maybe they have slightly different attacks, but really only in the way that Dr. Mario throws pills as opposed to regular Mario’s fireballs. In between the last paragraph and this one, I actually stopped to finish the game, and it turns out that the third tier was the last. Red Khezu, despite being a buffed palette swap, was the hardest of the four and Monoblos, the final monster, was relatively easy. Getting even an A rank on him will be nearly impossible, but having spent as much time getting murdered by his big brother Diablos in MH3 as I did, he’s not super hard to kill. 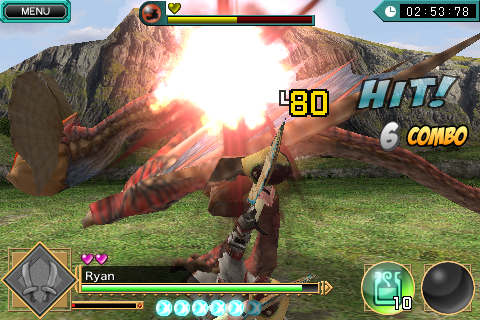 In the end, I feel that Monster Hunter: Dynamic Hunting was an excellent investment of $5. Yes, it’s a little more expensive than the average iOS app, but it’s also cheaper than Final Fantasy III, and I think that MHDH will provide a more balanced fun:grind ratio. 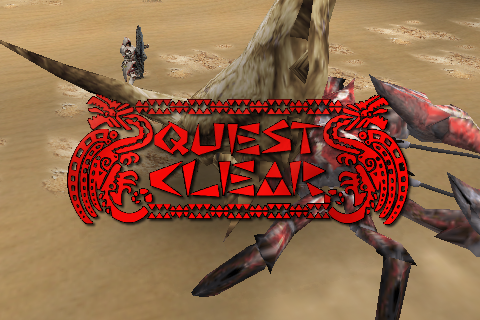 Given, all I really have left to accomplish in the game is to bolster my hunt ranks, grind out all the equipment and earn all the achievements, but I think that even this very basic Monster Hunter experience is a fun and exciting one. Not to mention that now I have a true portable version of Monster Hunter. 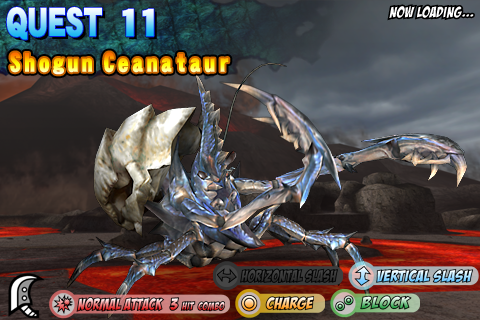 EDIT (17/09/11) : Due to the constant updates applied to mobile games, there is now a fourth tier of monsters available to fight. Kushala Daora is not among them, but my old nemesis Tigrex is.